글라스고, 스코틀랜드의 스미스 호텔 | 호스텔월드에서 예약하세요. 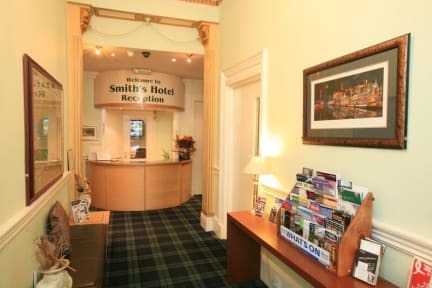 The Smiths Hotel is a warm, friendly, family-run hotel consisting of 42 bedrooms located on Glasgow's bustling Sauchiehall Street. We offer good-value budget accommodation & are minutes away from Glasgow's many museums, art galleries, theatres, entertainment venues, night clubs & shopping streets. The Smiths Hotel is home to 42 well-appointed guest rooms. We offer single rooms, twin rooms, double rooms, triple/family rooms, 4 bed rooms and 5 bed rooms which are either en-suite rooms or rooms with a shared bathroom. Room facilities include Flat-screen TV, Satellite Channels, Direct-Dial Telephone, Adjustable Heating, Electric Kettle, Tea/Coffee Maker, Wardrobe/Closet, Towels for free, Hospitality Tray & Wake-Up Service. An Iron, ironing board & hairdryer are available on request at the reception. Cots / Highchairs - Please enquire at main reception before reservation. No extra charge. Children under 5 years of age free of charge. We serve a full Scottish breakfast daily from 7am to 9am. On Sunday, the breakfast is from 8am to 9.30am. The rooms are Non-Smoking & Free Wi-Fi is present throughout the Hotel. Check in is from 1pm and Check out is 11am. We have a 24 hour reception and CCTV. Luggage storage facility is available. We are pleased to provide complementary Free private parking- an exclusive feature for a city centre hotel. This is located at the rear of the Hotel and is subject to availability.